Milton Teagle Simmons was born on 12th July 1948, in New Orleans, Louisiana USA. As Richard Simmons he is a physical fitness expert and voice actor well known for his fitness series “Sweatin to the Oldies” and his extravagant personality. Lately, he has been active in politics supporting the act “No Child Left Behind” which promotes physical education in public schools. He has been active as a public person since 1969. The main sources of Richard Simmons net worth are considered to be fitness training, its products and television. Over his long spanned career, Richard has accumulated the net worth of $15 million. To begin with, Richard Simmons was born into a family of show business people, and grew up in the French Quarter of New Orleans. The boy was overweight from his childhood, and it grw progressively worse as when graduating from high school he had reached the weight of 122kg. He initially studied at the University of Southwestern Louisiana, then transferred to Florida State University. He participated in an exchange student program and studied in Florence, Italy for some time. After graduation with a BA degree in Art, he settled down in New York and did various jobs including waiter. Later, he worked for cosmetics companies Coty and Revlon. His debut in the entertainment industry was in the role of an obese man in the Italian fantasy drama film “Fellini Satyricon” (1969). By the 1970’s he had moved to Los Angeles, where he began his career as a fitness instructor. Richard himself lost 56kg and decided to help other people to do the same, though the issue he understood clearly was unhealthy eating problems. He knew that people needed not only to exercise but also to learn to eat healthily and properly. So, he opened the gym studio alongside a salad bar restaurant to teach both. Over his career Simmons has released a number of books, like “Reach for Fitness: A Special Book of Exercises for the Physically Challenged” (1986), “Still Hungry After All These Years: My Story Gt Pub Corp” (1999) and many others, many analogue compact cassettes and compact discs such as “Take a Classical Walk”, “Wicked Workout” as well as visual media in the form of video cassettes, which later changed to the DVDs “Richard Simmons and the Silver Foxes”, “SuperTonin’: Totally Tonin’ with Toning Rings” and others. It is worth mentioning that all Richard Simmons work related to fitness somehow increased the total size of his net worth. 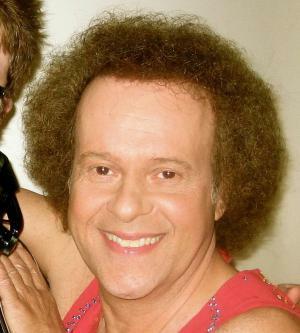 As a very energetic and charismatic personality, Richard Simmons is loved by audiences and is often invited to take part in various mass/media productions. He was a frequent guest in such shows as “Rosie O’Donnell Show”, “The Howard Stern Show”, “Late Night with David Letterman” etc.The episode “Remote Control Man” (1986) in the television series “Amazing Stories” by Steven Spielberg was created about the life of Simmons. More, he landed roles in various commercials. All Richard Simmons’ appearances on media added financially to his net worth, too. The two things Richard Simmons never talks about are personal life and death. So, there is no information about his private life, though rumours have spread that he is gay. 1 Take a moment every day to find peace. Pull over to the side of the road, turn off the radio, and find peace. 2 When I lost my weight, I went and bought about 15 different types of underwear to see what would look good on my new body. It's exciting! 3 Puberty for me was graduating from Thousand Island salad dressing to Caesar salads. It was like going from hot dogs and hamburgers to beef stroganoff, or from ice cream in a cone to creme brulee. 4 I don't know about you, but every time some joker points me out as I walk through an airport wearing extra-small Dolfin shorts, a tank top and leg warmers, I get a little upset. 5 I have rules about eating, exercising and rules about staying positive. And these rules are sacred to me. 6 My way is the sensitive, emotional way, because that's who I am. I try to be the clown and court jester and make people laugh. At the same time, you have people in the hospital who have had gastric bypass or lap-band surgery, and they still have to work out. If you don't work out and eat healthy, you'll look like a melted candle. 7 I'm such a huge fan, and I've done classes of all Lady Gaga music. And she's just someone who evokes freedom and love for her fans and passion in what she does. Lady Gaga, I'll take you out for a salad anytime. 8 People are still grasping for the miracle, and unfortunately, there are no miracles, if you do not exercise for a year, and let your body remain dormant, then you will gain weight. 9 How do you get motivated? By knowing your worth. Americans do not know how worthy they are. You deserve to be healthy, but a lot of times, people have, as a child's been told - as a children been told that they're no good, that they're never going to be anything else. 10 Miley Cyrus, like all of us, needs to be loved. We all come from complicated parents... I understand her, and I love her, and I think things will be different with her. But you know, in the music business, sometimes you have to shock a little. 12 Number one, like yourself. Number two, you have to eat healthy. And number three, you've got to squeeze your buns. That's my formula. 13 When I go to bed at night, I ask God to give me another day; I ask him to keep me strong and make me a good teacher and to keep spreading this right word. 14 If your oxygen mask drops down, it's time to take a breather! 15 I'm not into any show that makes people compete when they lose weight. 16 Our children are obese, either have or being threatened by diabetes, high blood pressure, high cholesterol, and not socially adjusting properly to others because of a lack of fitness. 17 Everyone in this world is somehow connected. So why not just be nice to everybody. 18 One day I may be meeting you and hearing how you've changed your life by saying, 'Farewell to Fat'. 19 For my workout, I'm up at 4 A.M. I say my prayers, count my blessings, and I work out right away. I just get it done. 20 Count your blessings. You are one of a kind. There's no one in the world like you. You are amazing. 21 No one is perfect... absolutely no one. Like precious stones, we have a few flaws, but why focus on that? Focus on what you like about yourself, and that will bring you happiness and peace. 22 I get tired of negativity in our country. I get tired of people who only want to know dirt. I get tired of people who don't believe in themselves. 23 I don't talk about my personal life, and I don't talk about death. 24 My parents always told me to be myself. I was always funny and silly as a kid. And I would always make them laugh. And they always told me to dream big and follow those dreams. 25 Everyone has a story that makes me stronger. I know that the work I do is important and I enjoy it, but it is nice to hear the feedback of what we do to inspire others. 3 During his 4-year stint on General Hospital (1963), Simmons began personally answering fan mail. To this day, he still personally answers e-mails & letters, and makes hundreds of phone calls a week to people who seek his help, or who simply need to begin with a motivational phone call. 4 Honored for his dedication to the cause of Health & Fitness with his induction to the National Fitness Hall of Fame in 2006. 5 Briefly studied for the priesthood. 6 His top weight was 268 lbs before he learned to control it. 7 He was initially motivated to lose weight when he received an anonymous note, left on his car, reading, "Fat people die young. Please don't die." 8 When appearing with two of his weight-loss clients on the The Howard Stern Show (1990) in 1990, Stern taunted his clients by waving food in front of their faces using a fishing pole. A large roasted chicken was lowered from the ceiling as well, to the shock and dismay of Richard's clients. One of those clients, Michael Hebranko, later ballooned to over 1,000 pounds and had to be rescued from his New York brownstone by 20 paramedics, policemen and firemen. Though he quickly dropped much of the weight he had regained, three years later Hebranko again had to rescued from his apartment after gaining the weight back. 9 Loves Barbra Streisand, Broadway musicals, and one of a kind Art dolls, and Art Glass...having been an Art Major in college himself. He owns a vast of Art Dolls. Much of his Art Glass collection was destroyed by the Northridge Earthquake. 10 He runs his own workout studio, Slimmons. He opened it over 30 years ago,in Beverly Hills, California after finding that established gyms and exercise studios tended to favor already fit people while discouraging beginners and the overweight. As such, he endeavored to create an encouraging environment for that previously neglected clientèle. He still teaches three days a week when he's in town. 11 Much of his hair fell out due to losing weight in an unhealthy manner. He then had to have hair transplants, moving some of his own hair from the back of his head to the front. He urges others to lose weight in a healthy manner so they won't have the same problems he did. 12 Has not appeared on the The Howard Stern Show (1990) since November 1992, though he was once a regular guest. During his last appearance on the show, he ran out of the studio in tears after Howard told him "Your belly hangs like your nuts." 13 Famous for always appearing in public in candy-striped Dolfin shorts, and tank tops that have been hand decorated with Swarovski crystals.